Below is the County Map of Shasta in California showing the boundaries, roads, highways, towns and much more. Siskiyou County is located adjacent to the Oregon border in inland Northern California. With a total area of 6,347 square miles, it is the fifth largest county in California. 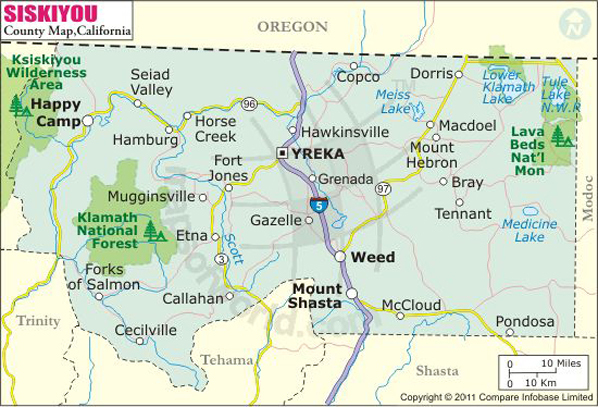 Its county seat and largest city is Yreka. Owing to year-round outdoor recreation opportunities and Gold Rush era history, the Shasta Cascade region is a premier tourist destination in Northern California. At 14,162 feet, majestic Mt. Shasta is the most notable geographic feature in Siskiyou County. It is home to lakes and dense forests, deserts and beautiful waterfalls. Pastoral Scott Valley in the country's western portion features many wide, tree-lined meadows and supports large cattle ranches. The Klamath, Sacramento, and McCloud Rivers offer some of the best trout-fishing spots in California. Lake Siskiyou, Mossbrae Falls, Castle Crags State Park, and Mount Shasta City Park are major attractions in the county. Amtrak's Coast Starlight train stops daily at the Dunsmuir station. Interstate 5 passes through cities of Dunsmuir, Yreka, and Weed in Siskiyou County. State Route 96 and US Route 97 are major east-west corridors in the county. STAGE operates local transit linking the populated areas in the county.